We’re slowly recovering from the excitement and energy and general brilliance of Sunday, but before we collapse entirely in a heap we have to thank everyone who made it such an enormous success. First and foremost we have to thank you – every single one of you who came. At the end of the day, Pedal on Parliament is only the sum of the people who turn up and you did in your thousands and that made it all worth while. We owe a huge debt of gratitude to CTC Scotland and Andrew Cyclist for providing some vital funding – CTC Scotland, who have supported us right from the start, for money for printing all those flyers, and Andrew Cyclist (and the McNicolls) for stepping in at the last minute and providing a proper sound system at Holyrood. On a related note, we’d like to thank Lynne and Ian McNicoll, and Ian Fyfe and Linda Hamilton, the families of Andrew McNicoll and Audrey Fyfe, for coming along and supporting the ride. We salute their courage in turning their own personal tragedies into a fight for everyone and we urge you to support the McNicolls’ fundraising work for Andrew Cyclist and It’s Good 2 Give, and the Fyfes in their battle for justice for Audrey. We want to give a huge cheer to Graeme Obree, who took the time to come and support us and gave such a barnstorming speech on the day. We wish him every success on his world speed record attempt – with the good wishes of each and every Scottish cyclist at his back, he must surely achieve it. We’d also like to thank Sir Chris Hoy, Chris Boardman and Mark Beaumont, all of whom have done a lot to raise our profile and make sure we made the media in the run up to the event, and Grant Stott for coming along, despite not being an avid cyclist. He helped us reach out beyond our core cycling supporters to those who genuinely are ‘everybody’. We’d like to thank the politicians who turned up and spoke (and the hecklers who made sure the minister knew exactly what the crowd thought of the current policy). We’d also like to thank those who came along for the ride, and here special mention must go to Kezia Dugdale and Ian Murray for doing it on Sara’s tandem. The more politicians who come, whether to speak or to listen, the more they will understand that we are not some special interest group, but a cross-section of society who just want to ride our bikes free from fear. We’d like to thank Spokes Edinburgh not just for lending us Dave Du Feu but for providing the background information and facts and figures about cycling in Scotland that went into our manifesto. Although they’re the campaign for Lothian, their research and knowledge is Scotland wide and they’re a vital resource for anyone campaigning on cycling. 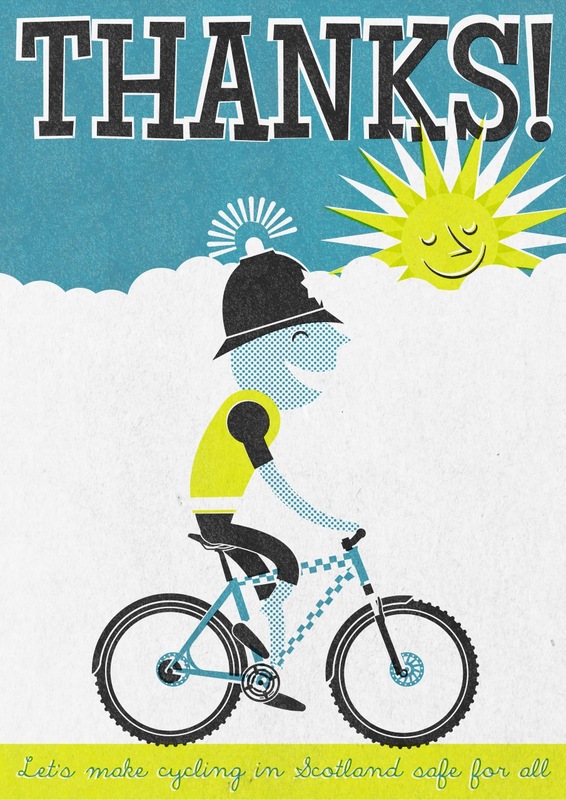 We’d also like to thank all the local campaigns who organised groups to come from their area, and Cycling Scotland and Scottish Cycling and other groups (cycling and non-cycling) for helping to spread the word. We’d like to thank our team of awesome blue-vested marshals who were such a brilliant presence on the day and worked so hard to make the ride a success and make sure everyone was safe. Particular thanks go to Bruce MacDonald and Alex Robertson, our Chief and Deputy Chief Marshals who put a huge amount of effort and planning into the organisation on the ground. Special mention must go to Keridwen Jones for not only marshalling, but doing it dressed as a panda. We’d like to thank our feeder ride organisers who did a sterling job of ushering folk safely across Scotland to Edinburgh on the day, in defiance of hills, distance, kiltwalkers and the weather. Not only did they help swell numbers, they gave a real sense of momentum and enthusiasm in the run up to Pedal on Parliament and made us realise we were not doing this all ourselves. 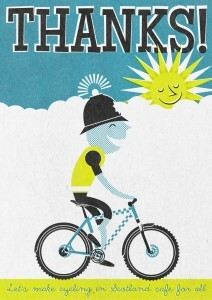 And we’d also like to thank those who joined them on their rides. We’d like to thank our army of posterers and flyerers for spreading the word on the ground. Never has so much printer ink been spilled, nor so many zip ties and laminators deployed in so good a cause (we’d also like to thank their employers for unknowingly donating the contents of their stationery cupboards). We’d also like to thank all of the bike shops, cafes, schools and other places that have displayed posters and flyers and done a huge amount to spread the word. Please support them! We’d also like to thank our virtual army of bloggers and tweeters and facebookers who have written, shared, liked and tweeted using words, videos, photographs and even songs. We’d also like to thank people on forums such as City Cycling Edinburgh, which have been such a vital resource for organising, recruiting volunteers and also letting us know when something we were planning was a bad idea. We’d like to thank everyone who has taken the time to contact their local politicians and let them know what they think, and signed the Get Britain Cycling petition. We’d also like to thank everyone who has made a PoP video, submitted their photographs to our flickr group, got in touch with ideas or support and responded to our survey about PoP. And if that isn’t you – then what are you waiting for? And finally, I personally would like to thank my fellow PoP organisers, the core team of Dave Brennan (whose mad idea it was in the first place), Sara Dorman, Kim Harding, Hugh Thomas, Alan Munro, Bruce MacDonald, Alex Robertson, Keridwen Jones and Dave du Feu. Special thanks should also go to Andy Arthur (poster designer extraordinaire) and Anthony Robson (trailer maker extraordinaire) and to Chris Cooke, Niall Craig and Julie Thomas for their early PoP support. We also have to thank the most junior member of the team, Kyle, baker and fundraiser extraordinaire, who did a creditable job of feeding the 4000 on the day. We also owe a debt of gratitude to Dave Gardner of Laid Back Bikes for the loan of his shop for organisational purposes, and Chris Hill for the loan of the ‘t-shirt bike’. We couldn’t have done it without you. Thank you all.